Earners of this badge know how to configure a SensorTag to send input to the Watson IoT Platform; create a Node-RED app to listen for motion events; convert motion input to English sentences; connect a light to the Watson IoT platform and use the Raspberry Pi as a gateway; control the light from the Node-RED app; use the Natural Language Classifier and Natural Language Understanding services to interpret commands; and how to add a speech input to the app. 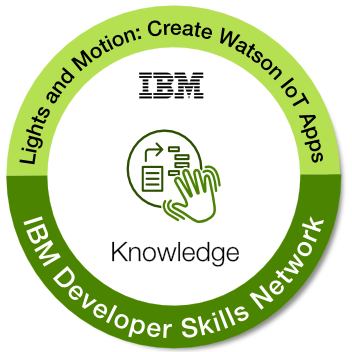 Completion of the developerWorks course "Blinky Lights and motion detectors: create fun Watson IoT Apps". Pass the in-course assessment with a score of 80% or higher.